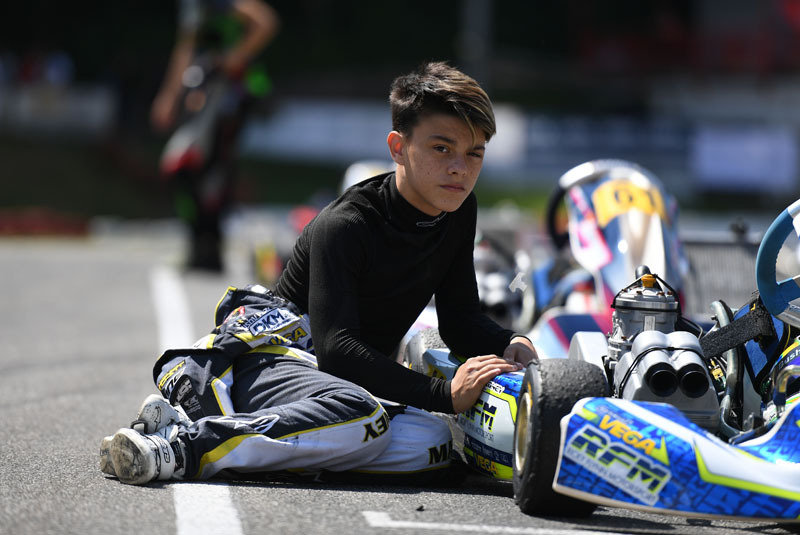 After Lonato (Italy) and Wackersdorf, the four DMSB kart racing grade series already started into the second half of the season last weekend. 165 drivers from all over the world fought for further important championship points on the 1.063m long track in Bavarian Ampfing. Emilien Denner (DSKC), Jorrit Pex (DSKM), Kai Askey (DJKM) and Harry Thompson (DKM) are now starting the eight-week-summer break as the half-time champions. The race in Ampfing was seen as the big rehearsal for the FIA Kart European Championship that is going to take place in two weeks. After a twelve-year break, the grade series is coming back to Ampfing with the Kart Grand Prix of Germany. Numerous participants of the DJKM and DKM are also going to start at the EM on the Schweppermannring. The weather posed a special challenge this time again. After heavy rains during the past events, this time the sun dominated everything and literally caused hot races. The two racing days in Ampfing were accompanied by an extensive live-stream as well as numerous highlight clips on social media. The best scenes from Ampfing can be viewed again on June 17th at 12:40pm in a 30-minute DKM-magazine on MOTORVISION.TV. Behind the Kali Kart-driver there were a couple of changes though. Patrick Kreutz (RS Motorsport) achieved a strong comeback. After an eight months long break he was back in his kart and immediately achieved second place at the first final race. Behind the Aachen resident things got exciting again towards the end of the race: Luka Kamali (TB Racing Team) got under a lot of pressure, but was able to fend off his pursuers’ attacks and defended the last place on the podium. Fourth and fifth drivers were local driver Tobias Mähler (Kartshop Ampfing) and Thomas Neumann. While Denner was unstoppable again during the second final race, his combatants on the other places on the podium also experienced a balanced race. This time, Kamali followed in front of Kreutz on second place. The decisions among the field of pursuers were a lot narrower: Neumann seemed to finish the race on fourth place, but a falling out during the next-to-last lap stopped the CRG driver. New fourth winner was Alessio Curto (Valier Motorsport), who gained 13 positions due to a sensational catching-up race. Behind him, Mähler received the remaining cup on fifth place. South Tyrolean Fabian Federer (SRP Racing Team) experienced a perfect start into the second half of the season at the Shifterkarts of the DSKM. On Saturday, he was the fastest driver of qualifying and also defended his top position during the course of the heats. During the first final race, Jorrit Pex (CRG Holland) was back at the top with a perfect start. Federer stayed in the wind shadow of his CRG brand colleague though and attacked a short while later. Until crossing the finish line, the result didn’t change. Federer celebrated his second victory of the season in front of Pex. Marijn Kremers (Birel ART Racing) who closed the gap on Jorrit in the end but didn’t have a chance to attack anymore followed on third place. Stan Pex (CRG Holland) came in fourth in front of best German driver Maximilian Paul (DR SRL) on fifth place. Pex achieved the best start into the race again this time. But unlike the first race, he defended his lead this time and strengthened it considerably until crossing the finish line. “I’m glad to have won. After things were really difficult during the heats yesterday and also during the first race, everything went well now. The balance of kart and engine was perfect. Due to this I was able to go easy on my tires during the race and secure the victory”, the happy winner summed up the racing events. Behind him followed kick-off winner Federer, who thereby finished a successful weekend on the podium and is now just one point behind Jorrit Pex in the championship. Stan Pex achieved a place on the podium by coming in third this time. Jorrit’s younger brother temporarily lost his place to Kremers, but fought his way back a short while later. Behind them, Daniel Stell (Mach1 Motorsport) was the best German driver on fifth place. The field of the juniors was completely filled up again with 51 drivers and promised a lot of excitement. First driver Paul Aron (Ricky Flynn Motorsport) was in his element – on Saturday the competition couldn’t get close to the youngster. Aron won qualifying and the following heats. He started into the first final race from pole position accordingly motivated and celebrated another triumph after 19 laps. “That was a really good race. We’re now going to analyze the details and attack again during the second race”, said the winner at the finish line. His pursuers were really close together though and caused a change towards the end of the race. Kirill Smal (Ward Racing) passed by Kai Askey (Ricky Flynn Motorsport) on second place. British Askey stuck to his guns though and regained his position during the last lap. Josh Dufek (Forza Racing) and Thomas Ten Brinke (Ricky Flynn Motorsport) showed a great fight for the remaining cup ranks as well – the duo completed the top five. The same five protagonists also decided the achievement of the cup ranks between them during the second final race, but changed their order in the process. Until the middle of the race everything pointed towards a double victory for Aron, but the youngster lost quite a lot of his performance and the competition closed the gap again. Smal took advantage and fought his way past the leading driver. In his wind shadow, Askey passed by too and put his team mate on third place. Fourth and fifth places changed as well – this time, Ten Brinke came in in front of Dufek. In the championship, Askey strengthened his position and now has a comfortable advance of 50 points. His strongest pursuer is team mate Harry Thompson. The youngster of the Red Bull junior squad fought a great duel with German Alexander Tauscher (Lanari Racing Team) during the first final race. The driver from Mitterfels prevailed and stood on the podium on second place. Czech Roman Stanek (Kosmic Racing Department) seemed to be on the secure fourth place, but got slower and slower towards the end of the race and had to let David Liwinski (Mach1 Motorsport) and Marius Zug (RB Racing Team) pass him by. Liwinski received a time penalty after the race though and was only ranked sixth. One of the German title favorites, Hugo Sasse (TB Racing Team), had bad luck: Due to an accident at the start he fell back considerably and only came in 19th. The start into the second final race was turbulent: Tauscher was the one who suffered – he fell back to midfield after an evasive maneuver. Maloney and Thompson calmly drove their laps on the top positions and achieved a double success for their team. The fight for third place was still exciting though. Staneks performance decreased towards the end of the race again and he got under a lot of pressure. This time he was able to defend his position and came in third in front of best German driver Niels Tröger (RTG Kartsport). Behind them, Kas Haverkort (Zanardi Racing Team) completed the top five. The reigning junior champion received a time penalty though and lost two positions. New fifth winner was Andrea Rosso (CRG Holland). The DKM is now going to take a small summer break until the next race on the traditional Erftlandring in Kerpen. The crucial phase of the fight for the 2018 title is going to take place in eight weeks from July 27th – 29th.